Has it really been a week since my last post??? I have missed so much happening out there on all of the wonderful blogs I stalk and I apologize to all of my sweet and amazing bloggy friends for not stopping by and leaving you any comments. This week was filled with panic and stress because what some of you might call the Curriculum Cops were paying my school a visit. I HATE people coming in my classroom and it worries my beyond words. I still get nervous when my principal comes in my room. I know what I need to work on and was ready to make a list of those things, tape them on my door, and then shut and lock my door. I was really worrying about if they would ask my kiddos any questions. Holy Moly....that is a ticking time bomb because who knows what will come out of a Firsties mouth. I was also worrying because I know some of the things we are asked to do may not be developmentally appropriate for my kiddos AND there is also NO WAY on God's green Earth that you can get it all in. I am not a magician but feel like that is what we are asked to do daily trying to get it ALL in. The stress of doing all of that then turns me into a warden at times. I found myself at times this week having less patience than I usually do because I was trying to do things the way they think we should. And who cares that it was the week before Spring Break, Dr. Seuss' birthday, AND time to start our DRA assessments PLUS individual math assessments. Many times it seems it comes down to following your head or your heart. I want to do what is best for my kiddos. I know the Curriculum Cops who visited us want what is best for ALL of our kiddos too. But they also have people telling them what they need to be doing and what the children in my classroom need to be doing. No one seems to care about the number of ESL kiddos we might have in our rooms or the number of children who have been identified as at-risk or the fact we might have 7 children who might be dealing with burdens such as abuse, parents in jail, homelessness, poverty, or the fact they only meals they eat are the ones they get when they come to school. ALL children regardless of their circumstances are expected to make the same achievements and academic gains, right??!!???? My head knows what the expectations are and what my curriculum tells me I need to be teaching. Then I look out at the 17 little faces who look up to me and trust me. I think at times if I were to die tomorrow would I want people to say that I did a good job teaching my curriculum or that I loved my kiddos with all of my heart and tried my best to help each child reach their fullest potential AND feel successful. It is so easy to forget and lose focus that we aren't teaching just a curriculum or standards. I am also not saying that you cannot teach the curriculum and make it fun and engaging because you can! I had to remind myself of this poem I shared a few months ago. I will try my best to teach my curriculum but I will also remember that God put that child in my classroom. My job is to teach them reading, math, and more...but I also need to give that child my unconditional love, patience and understanding, and help that child know they can touch the lives of others by being kind and helpful. 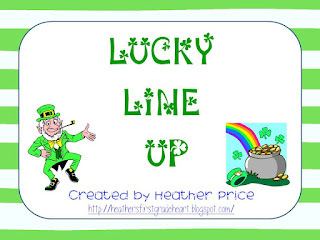 Hop on over to my TpT store and grab this fun March *freebie*! While you are there, I would love for you to follow my store. If you think you already follow it, please try again because I once had a link that didn't work! 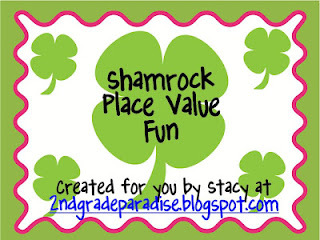 =) Click on the picture to go grab it from my TpT store. While you are blog stalking this week, you need to go visit a few blogs that might be new to you. First, you need to go visit Stacy at 2nd Grade Paradise. Stacy is a sweetheart and an awesome 2nd grade teacher. I would love for any of my Firsties to have her as their teacher. Stacy has just started creating *freebies* and they are so cute! =) Stop by and grab this game. Next, you need to go visit Cheryl at Crayons and Curls. I LOVE Cheryl! She has followed me when I first started blogging and didn't know what I was doing....wait, I still don't know what I am doing! =)﻿ Cheryl is also a Texas teacher...WAHOO! She teaches Kinder and is so awesome. She is a great follower who will always help you if you are having a giveaway or just needing some encouragement. Hope next week is more relaxing! That is such a great poem!! Thanks for sharing:) I think we all have those days when we question what we do and why? But like you said, just knowing that you can affect a child in a positive way, makes it all worth it! I know from your posts that you are an *amazing* teacher! Keep doing what you're doing!! I hope your week ahead is better. I think you're awesome! Heather, you are such an inspiration. Your posts are so touching. After 18 years of teaching, my heart continues to hit rock bottom while breaking out in sweats when the "higher ups" come to visit. In our county, we have a pacing guide in which we must be on the exact school day at all times. I am always on edge. I agree, we should teach the child then teach them academics. Thanks for sharing a fun freebie and some great words of wisdom. We don't have curriculum cops where I teach but I worry about getting it all in too. It's hard to balance all the things we have to do. I really wish some people that make these decisions about what we're suppose to teach would spend a day or two in our classrooms. It might change their minds. My fiance asked me the other day how I was suppose to teach a child to read who doesn't even really speak. Thanks for the encouraging words and poems. You are so right! Just remember, at the end of the day, we're not teaching curriculum, we're teaching children! Sending good vibes your way! Enjoy your weekend! Heather....You are NOT alone!!! Just know that there are many of us out there, just like you, that are struggling with the same truths!!!! The HEART will always win!!! Thanks for the cute March freebie :-) How do you make your freebies? I am just getting into this freebie making thing! Love your blog! Love this blog...so I have given you the One Lovely Blogger Award. Stop by my blog to check it out! This is such a sweet post! I'm still a student, but even now I'm praying that I'll be able to reach my students (while I jump through curriculum hoops). This is such a great post, and the poem is awesome!! I gave you an award, come on over to my blog to check it out! :) I hope you have a restful weekend and prayerfully a better week next week. I hear you! I wrote a letter to our governor this morning (that I'll probably never send) with many of the same ideas. I sometimes think about my kiddos and how many of them are hurting. But you are so right - God put them in our room. Hey, Heather and blogging friends! Thanks for checking out my meager blog! I love updating for parents of my kindergarten kiddos and am tickled when others around the globe are interested, too! I adore your items and updates! I will be checking in regularly! I love the honesty of your blog and many times feel as if you are speaking what is on my mind, too. This is EXACTLY how I felt this week. We have a leadership team and they told me instead of having kids reading on or just about their level and focusing on teaching them HOW to read, they want us to read text above their level and focus on comprehension (which is also important but above their level? Choral read all the time? Don't focus on reading strategies???) I'm upset becuz I don't think it will be best for the kids... I had a little one (new, also ESL but good understanding of english) go from a Rigby level C in Jan to a level G last week! Frustrating. Thanks for letting me know I'm not the only one going thru this! Id love for you to stop by my blog.. I know you're super busy! Hi Heather, i just wanted to let you know that I have nominated you for the Top 10 Blog Award. Come by my blog to check it out. Thank you for being so open and honest. I think a lot of teachers feel the way you do. Honestly, I know I do. Hi Heather! I just love your blog! You say in writing here what I'm sure most of us think on a daily basis as we face the challenges of teaching in these changing times! Thanks for the inspirations! I have trouble keeping up with my blog too...And stopping by other blogs! Don't let the curriculum police get you down! We have them sneaking around too:( On a happy note, you have such a cute blog! Hi! I gave you a little award...come and get it! It is evident from your posts what a WONDERFUL and CARING teacher you are! I'm sure you kiddos love you and they are so lucky to have you as their teacher! I awarded you the One Lovely Blog Award for all of your sweet posts! Come to my site to check it out! Thanks for being so honest. We all deal with those kinds of issues in our own classrooms each and everyday. It's during those times that we need to reach out to each other and know that within our hearts that we are doing what is right for our class. Keep up the great work! Thank you for following and being so sweet! I have awarded you the One Lovely Blog Award. Head on over to my blog to check it out. Written perfectly! Although I'm still in school, this is so my outlook on teaching. Your words remind me a lot of my mother, who teaches kindergarten in a low income area. As teachers we are so much more than someone giving them an education, for a lot of kids we are the only consistent thing in their life. Such a huge responsibility. Thank you for this post! When I click on your blog from my blogroll I have to brace myself for tears - in a good way! :) it never fails, your posts touch my heart! Thank you! Thank you for being my FIRST follower! :) I feel honored! I am a fellow TEXAS teacher! Also...thanks for the freebies! Love them! I SO hear you! Not that it really bothers me having people in my room, but I am so often torn between what "they" want, and what I feel my kids need at that moment. I know how you feel. I too sometimes feel like a warden. SOmetimes we just need to let kids be kids. I on somedays feel like all I am doing is yelling and it is because of the pressure of having to do so much. Just wanted you to know that there are many of us who feel the same way. Keep up your good work and it will come out ok. I can NOT, can NOT, I tell you believe you put me in your post! WOW! I am so honored and thankful to have you as one of my very best blogging buddies!! You are just the sweetest thing...and I believe you have to be probably one of the MOST patient, sweet, and understanding teachers EVER just from reading your posts and hearing what you have to say. You always brighten my day...and I agree with you...I really wish we could work together! :) I think we would just randomly stop in each others rooms for a hug and pick me up....but we kinda' do that on here anyways huh? Virtually! Love you Ms. Heather! Thanks for thinking of me! 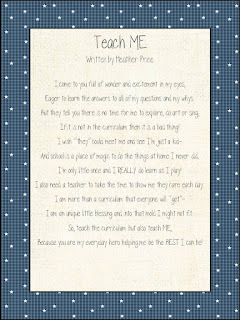 Have a beautiful day, and I can't wait to post this poem in my room...I have one of yours posted by my the door for kids, parents, fellow teachers, and administrators to see (AND ME) when we walk into my room! You rock it out, don't get nervous!!!!!! Tell your head or your heart that you've got it goin' on, because you do!!! Glad you're back...I'm having bloggers block...I've started a new post at least three times and just "x" out and say...maybe later. Don't ever forget, no matter who comes in your room, that you are an amazing teacher and your kiddos are lucky to have you! If it makes you feel better, I had a group of 20 principals do a walk through today... I couldn't even blog about it (yet)... one of my kiddos thought it would be appropriate to take his shirt off during the walk through! I just awarded you my Top 10 Blog award! :) Head over to my blog to pick up your award. :) Thanks for being so wonderful! I just LOVE your blog. Your thoughts, insights and words are inspiring for a new teacher. I will be a frequent visitor from now on! Even as a literacy coach I sometimes get a visit from the RtI police. Trust me, the last thing I want to do is have a couple suits observing as I try and teach 27 little bodies in the busiest room in a school-the teaching lounge! Let's just say my reviews are never great and always mention the interruptions of staff filling their coffee cups. Thank you so much for sharing the poem. I printed out a copy and put it on the back of my "very important book" to serve as a reminder to focus on the important things and not the curriculum/district program police. First of all I want to thank you for being my first "follower" on my new blog. You have no idea how giddy and excited I was when I saw that I had my first comment! :) I can tell by reading your blog that you are an amazing teacher, but more importantly I can see that you are a compassionate and caring person with a very strong faith. God bless you in all you do! I have nominated YOU, your awesomeness, for an AWARD! Swing on over to check it out! You are amazing and if you make an impact on your students even close to the one you have left on your followers you should feel very proud! I know you have truly impacted me! Hang in there. Having visitors in your classroom is always somewhat stressful, especially with the young ones but remember, it is your room and you know those children and you know what they need! Our big push this year is engagement of 100% of our children at all times. No one seems to take into account they have hungry tummies, they shared a bed with 4 brothers, and they don't speak English. WE know and WE love them! They love you for all you do Heather!!!!! I have left you an award on my blog. Please stop by to pick it up. Love your blog! Hop on over to my blog, I have nominated you for an award! Well said. I feel a constant pull to push, push, push our kids. I hate it! It is like asking a baby to run before they can walk. Your post made me realize that this is not just my issue, but everyone's. Thanks for sharing! I'm your newest follower! :) Your blog is awesome!! And, I'd like to thank you for following me as well. As a newbie to the blog world, it means a lot! Love the blog world and all the women in it! Hi Heather. Love your comment about how God has put that child in your classroom for more than just learning the curriculum. I believe that also and hope that one day my firsties will remember there was something different about me! Thanks for visiting my blog and inviting me to yours! You have some great ideas, a very cute blog, and you share wonderful insights! I saw above where someone else had asked about making your freebies. They are so cute and creative! What software/program/ etc do you use (for those of us who are still working on becoming more tech savvy!) ?